I am all about the metallics right now. I seemed to be into it big time every couple of months now! 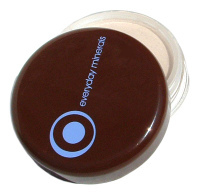 And I’m getting my fix right now from EVERYDAY MINERALS’ Eye Shadow in Laptop ($6/3.5grams or $2.50/sample @ everydayminerals.com) is a rich mocha with a touch of plum and totally wearable for day or night. I had a couple of readers write in about skin irritating ingredients in mineral makeup, foundation specifically. So many different lines are popping up these days that it’s starting to get confusing. So here’s what I thought we’d do – over the next two months, we’ll examine mineral lines on the rise, the kinds of ingredients they use and what that means for you. We’ve featured most of them on these pages before but let’s really get to the bottom of each. Ok, onward. First up, the EVERYDAY MiNERALS line and their line which includes Foundations, Finishing Powders, Pressed Powders. Created by an ultra-busy Mom, the Founder was one of the first estheticians in California making headway into the area of all-natural and organic in the area of beauty. * Besides having a vast array of foundation shades, they really go the extra mile in getting it exactly right with warm vs cool complexions. * Doesn’t contain some of the well-known skin irritating ingredients. * The packaging has some thought behind it. What I mean by that is I’m really not enticed by some of the Mom and Pop mineral makeup brands out there. Sorry but I need good-looking packaging too. So shoot me. * The website is not the easiest to navigate. * Sizes do not give you exact measurement of product. Did I miss this on the site?